We couldn’t let this southern soul release pass without mention, so good is the material on offer. 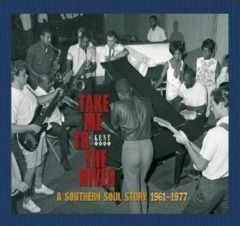 Take Me to the River: a Southern Soul Story 1961-1977 is a 3CD set from Kent that chronicles the golden era of southern soul. With 75 tracks on offer, from the likes of Joe Simon, James Carr, Otis Redding, William Bell, and Joe Tex, and featuring songs recorded in studios such as Broadway, Royal, Stax, and Muscle Shoals, it shows off the astounding quality of the music made in this tradition of American musical history. As it covers many classic songs ‘Take Me To The River’ is a compilation suitable for those unfamiliar with the sound, but it also includes a few tracks available on CD for the first time to whet the appetite of the connoisseurs. Each track has an accompanying essay to give the reader plenty of background information, as well as the usual label and artist shots that are compulsory for this sort of release. The monthly music magazines have been salivating over the compilation, so don’t just take our recommendation of it. Everyone seems to agree that this is one of the best compilations to have come out this year. Take Me To The River is out now and available for £27.98 from Amazon here.